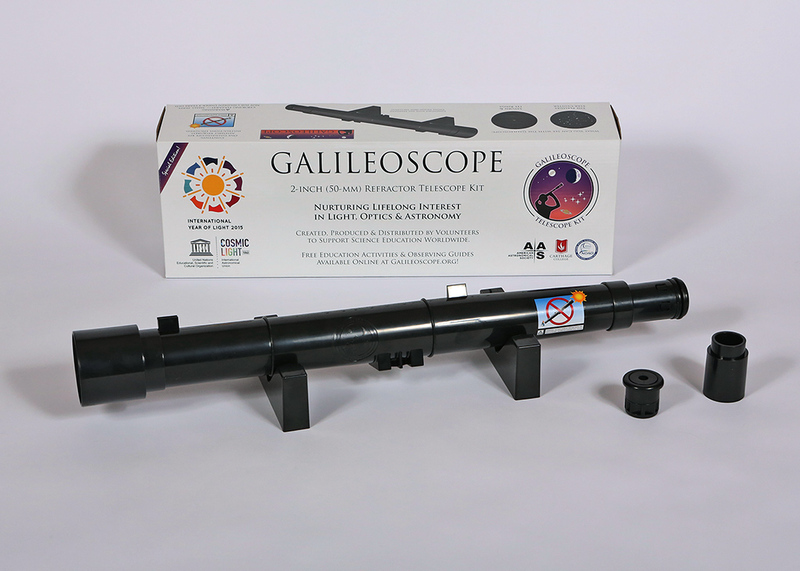 Galileoscope Educational Telescope Kit. Photo © 2015 Joson Images. Rainbow Symphony solar filter on Galileoscope. Photo by Rick Fienberg. KENOSHA, Wis. - May 30, 2017 - PRLog -- Galileoscope is now offering Galileoscope telescope and optics kits bundled with ISO-certified safe solar filters from Rainbow Symphony. This combination is perfect for the August 21, 2017, solar eclipse — for individuals, schools, clubs, libraries, museums, planetariums, science centers, and camps. Bundles of six kits and six solar filters are specially priced at $250 plus shipping and can be ordered directly at galileoscope.org/shop/case-of-6-kits-6-solar-filters. The Galileoscope (galileoscope.org) is a high-quality telescope and optics kit created by astronomers, optical engineers, and science educators. Because it is produced and distributed by volunteers, it is available at low cost to support science education worldwide. Some 250,000 kits are already in use in more than 100 countries. The Galileoscope is a 50-mm aperture, 500-mm focal length refractor and includes a 20-mm Plössl eyepiece (25x) and a 2x Barlow (50x), making it possible to see craters on the Moon, the phases of Venus, Jupiter's belts and moons, and Saturn's rings, among many other astronomical wonders. Anyone can learn how a telescope works while building a Galileoscope, which is easy to assemble without tools or adhesives. The kits are augmented with free standards-based educational materials and are suitable for people of all ages. Rainbow Symphony's solar filters are made from black polymer certified to meet the ISO 12312-2 international safety standard for direct observation of the Sun. 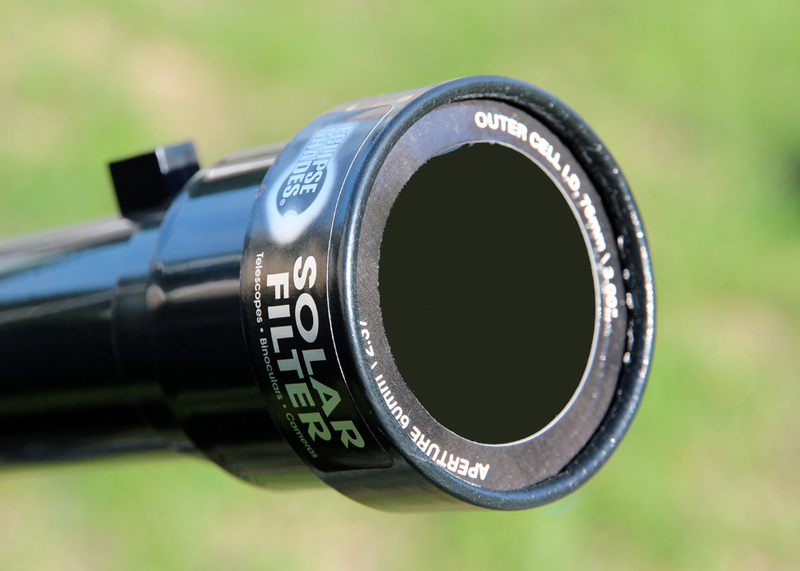 When placed over the front end of the Galileoscope, the filter produces a safe and comfortably bright yellow-orange image of the Sun in the eyepiece. During the partial phases of the August 21st solar eclipse across America (eclipse.aas.org), the safely filtered Galileoscope will reveal the Sun with a "bite" taken out of it by the Moon. Galileoscope users will be able to watch the Moon move across the Sun for the entire duration of the eclipse. Anyone within the 70-mile-wide path of the Moon's dark shadow, which stretches coast to coast from Oregon to South Carolina, will also experience a total solar eclipse lasting up to 2 minutes 40 seconds. When the Moon completely blocks the Sun's bright face and the sky turns dark as deep twilight, it is safe to look at the Sun without a filter to see the spectacular solar corona ringing the jet-black silhouette of the new Moon, perhaps the most awesome sight in all of nature. As soon as the Moon begins to uncover the dazzling solar disk again, it's time to use solar filters to watch the rest of the partial eclipse. Inventory of Galileoscope kits with solar filters is available now, and delivery times are one to two weeks within the USA. For more information about how to order, visit galileoscope.org/order-kits.